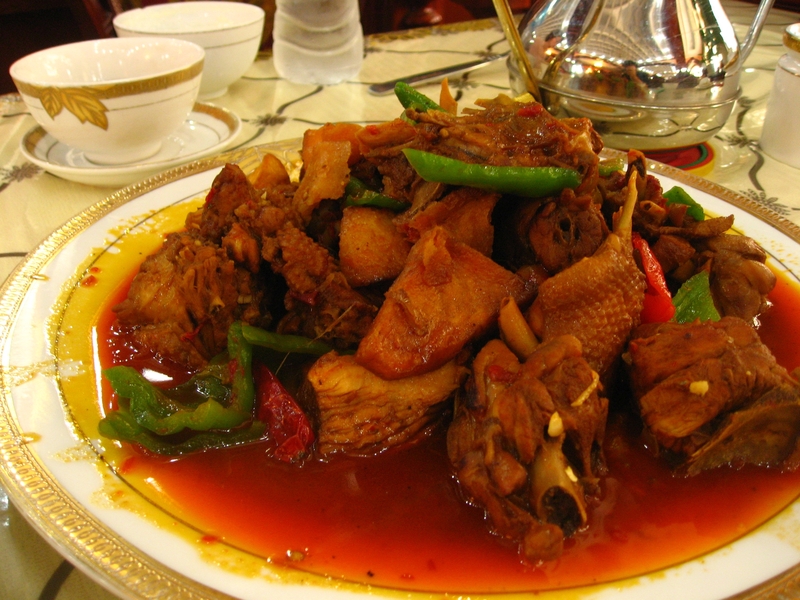 Da pan ji (大盘鸡 “big plate chicken”) is one of the few foods that is equally popular among Chinese and Uyghurs. 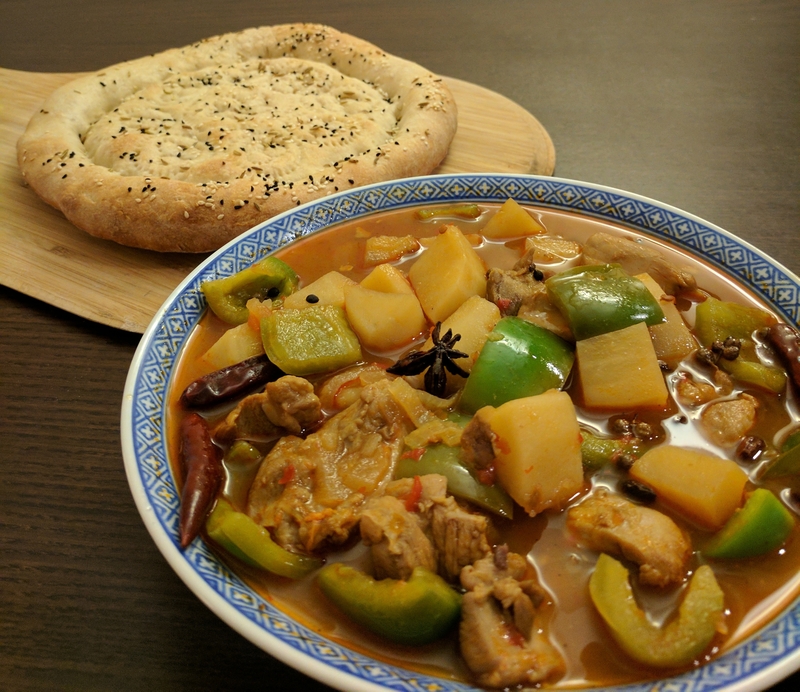 It originates from Xinjiang, but is claimed by neither group: Uyghurs regard it as a Chinese dish, and Chinese regard it as a Xinjiang specialty. 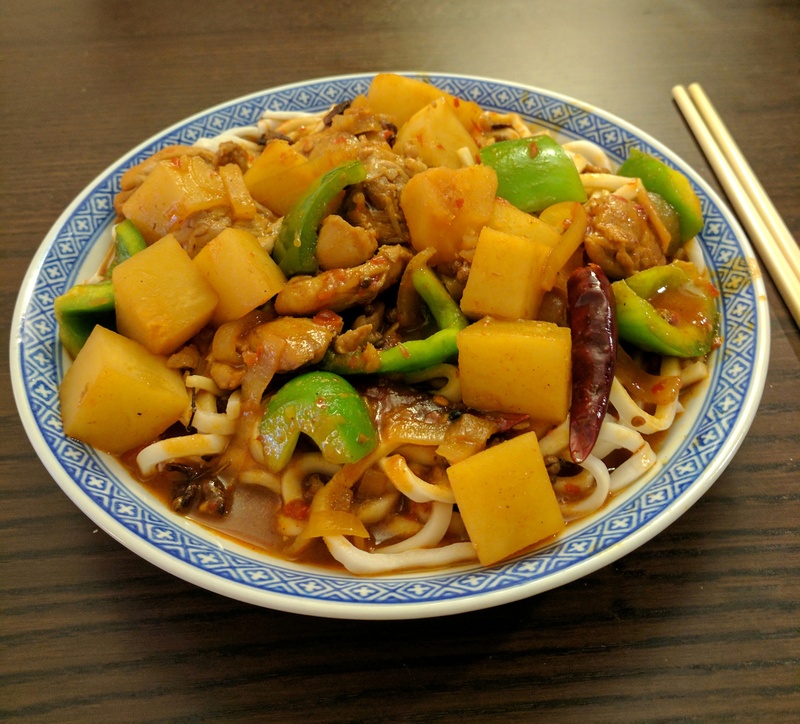 Regardless of who originally came up with it, it’s become quite popular in the rest of China and can even be found in Chinese restaurants abroad. 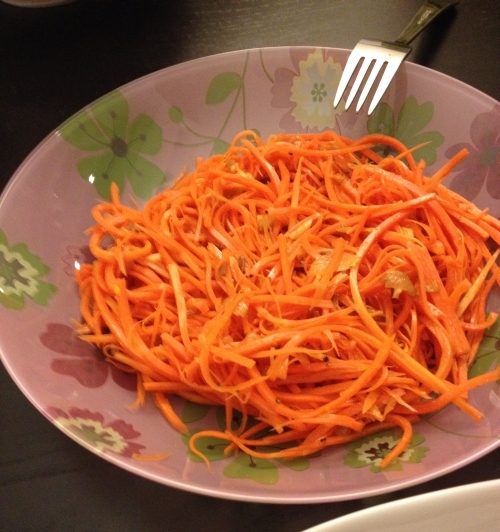 Dapanji served in an Urumqi restaurant. 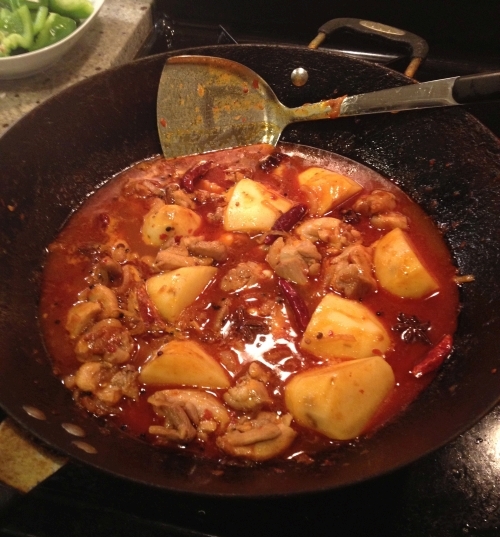 Just like the name, it’s a big plate of chicken stewed in a rich, spicy sauce with potatoes, green bell peppers, and chilies. The star anise makes it amazingly fragrant when complete. There are plenty of variations in the sauce and how it is served: some places serve it with noodles, other with bread, others just by itself. I personally love eating it with Uyghur nan bread to soak up the sauce. 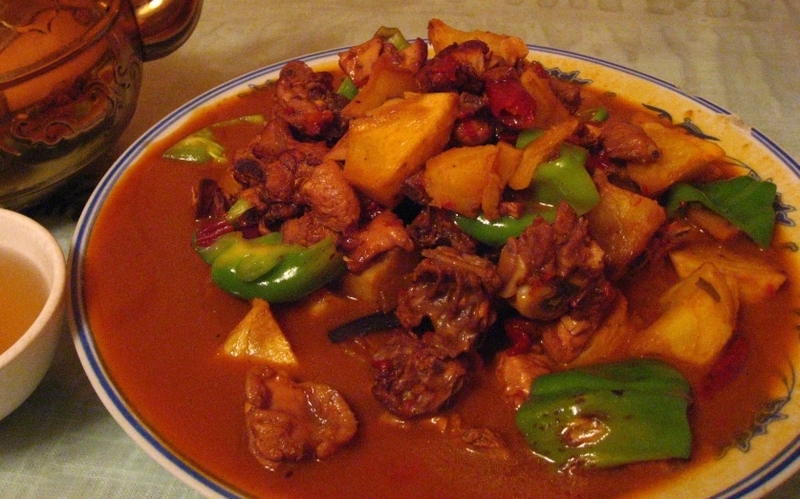 Dapanji served in a Kashgar restaurant. Nan bread is great with dapanji, recipe here. 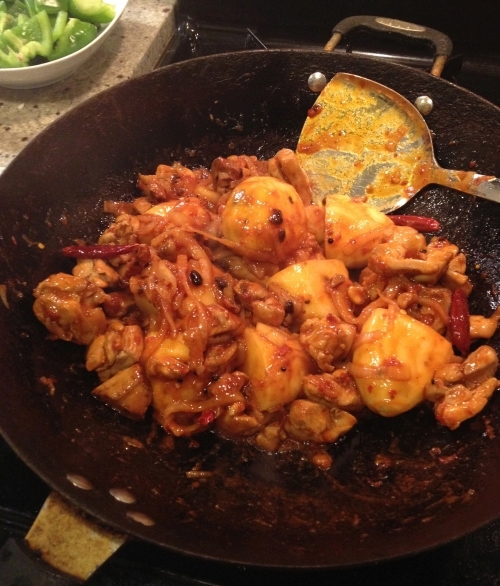 This recipe is adopted from JadeCw’s recipe on Xiachufang as well as Abdulaziz Salavat’s version. Prep: Chop the potatoes into medium pieces – not too big or they won’t cook through, not too small or they’ll get overcooked and make the sauce starchy. 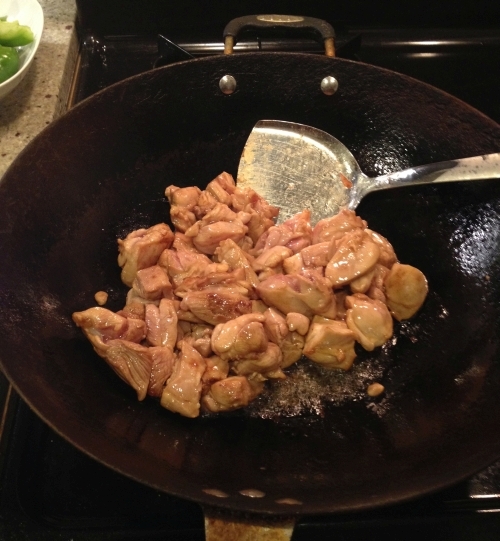 Chop the chicken into small to medium-sized pieces. 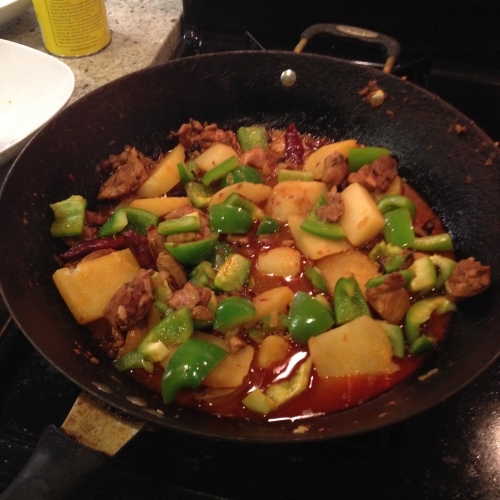 Chop the green bell peppers into medium-sized square pieces. 1. 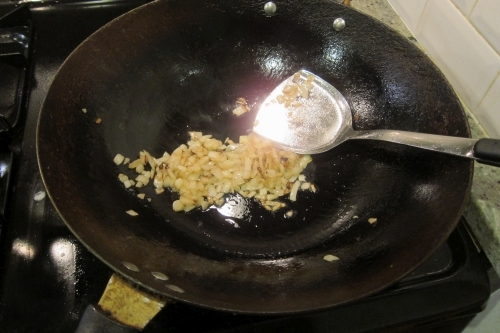 Heat the wok on high heat and add oil. When the oil has heated, add a small amount of sugar (1-2 teaspoons) and mix well. 2. 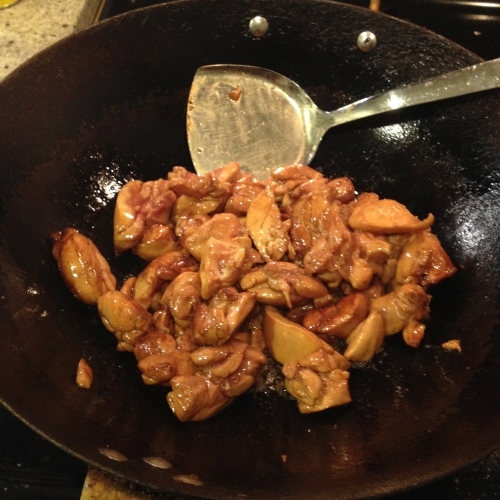 When the sugar has melted into the oil, put in the chicken and stir fry this until it is browned. The melted sugar will give the chicken a nice golden color. 3. Put in the onions and cook these until soft and light brown. 4. Add the black bean sauce, chili garlic sauce, and tomato paste. Add a good dollop of each – maybe 2-3 tablespoons worth. Mix everything well. 5. 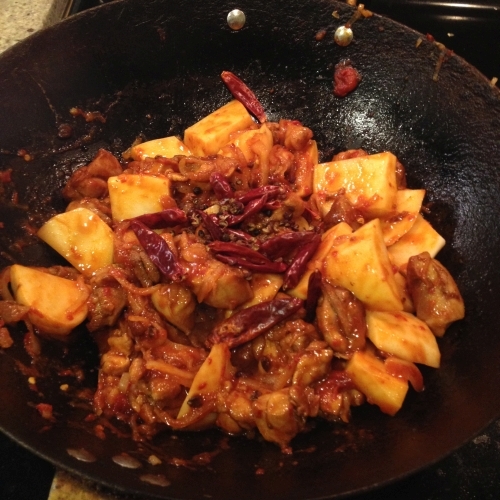 Salt, and add the dried chilies and Sichuanese peppers, mixing everything well. Add in the potatoes. 6. Add soy sauce, add the beer or wine (if you are using it), and add enough water so the broth almost covers everything. 7. Put in the star anise. Once the water boils, turn the heat down to medium. 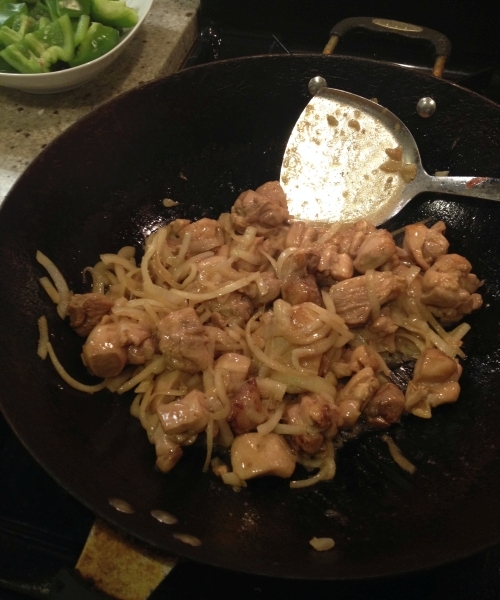 Mix everything well, cover the wok, and let this cook for at least 25 minutes. 8. Taste the sauce and reduce if too watery. 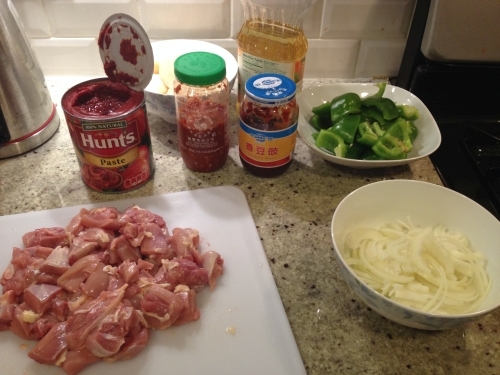 The sauce should be spicy, aromatic, and savory. Finally, add the bell peppers and let them cook briefly. Dapanji is one of those dishes that tastes better the next day after it has been sitting in the fridge; the flavors thicken and become more complex with time. 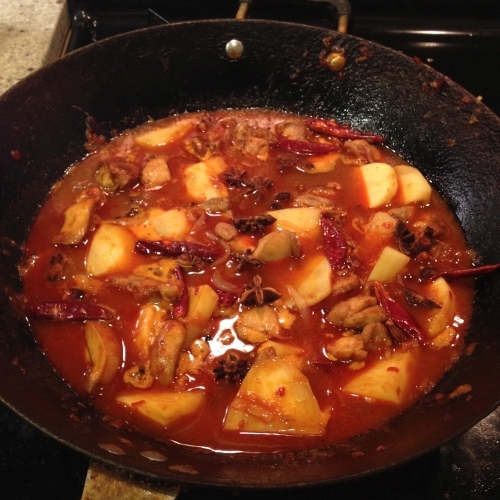 Ideally, let it simmer over minimum heat for a while before serving. 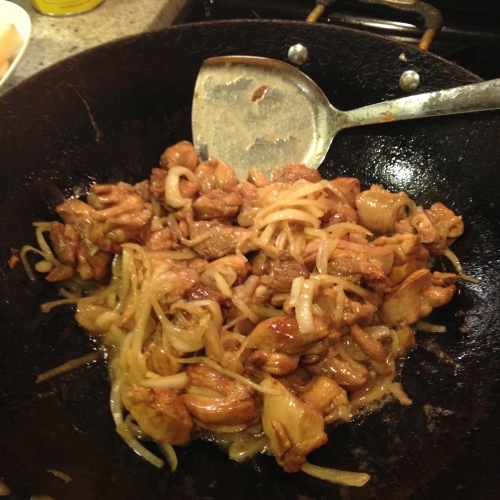 Serve in a big serving plate; you can put noodles or bread on the bottom to soak up the sauce, or serve them separately. Enjoy! A “salad” in America usually means something thrown together quite quickly – some fresh chopped vegetables, some dressing. If there’s any meat at all, then it’s usually extremely dry chicken breast. “Salad”, in other words, is a health food, a convenience food, something you eat on a diet, something you pick at as a side dish, but generally not something you actually want to eat. Not so in Russia and the former Soviet Union. 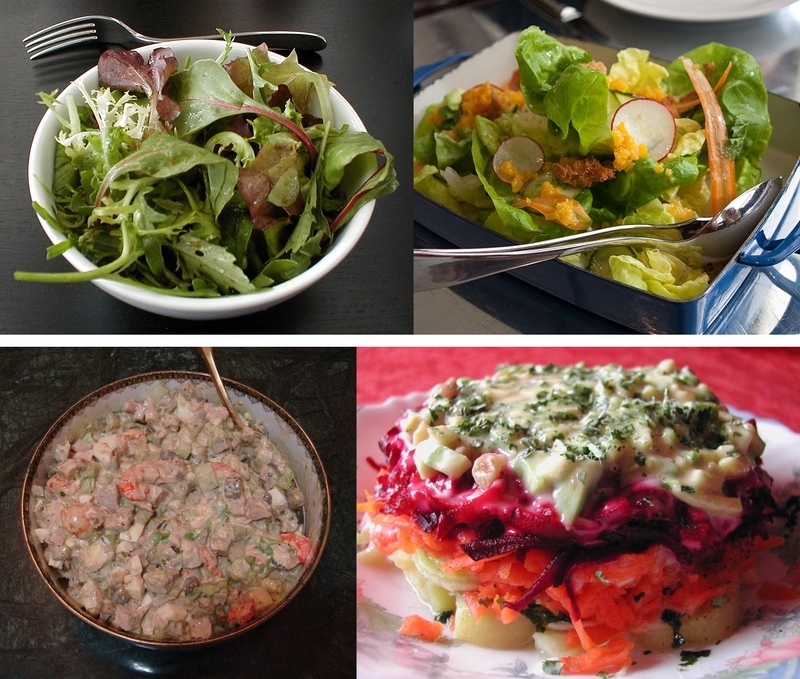 Salads are usually quite extravagant, complicated dishes served at parties or as a first course. And more often than not, they are anything but healthy – covered in mayonnaise and filled with all sorts of cold cuts. In other words, something you might actually look forward to eating! 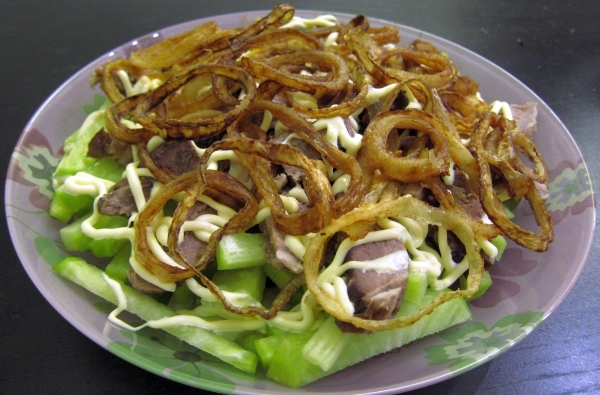 “Uzbekistan” salad, despite the name, isn’t part of traditional Uzbek cuisine. Supposedly, it was invented in the 1950s in Moscow when Uzbek chefs tried to introduce Russians to their national cuisine for the first time. It combines Central Asian green radish with the Russian love of mayonnaise – almost like an Uzbek version of the famous “Olivier” salad. It does look pretty “retro” – it reminds me of something you’d see in 1970s US cookbooks – but trust me, it’s delicious. 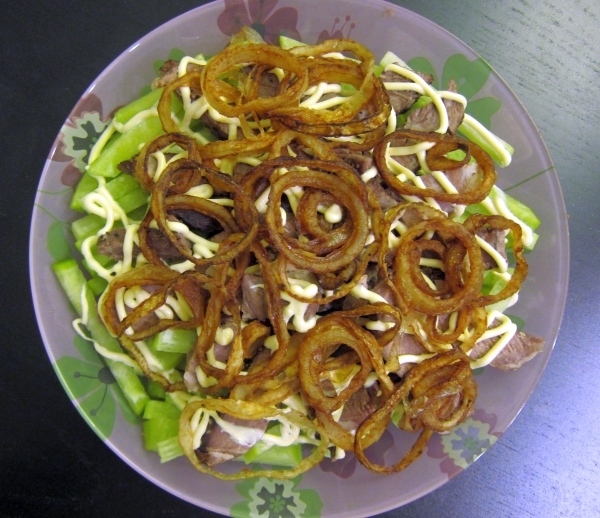 The green radish is a refreshing complement to the fried onion, mayo, and oven-baked steak. Green radishes. Asian groceries should stock them. 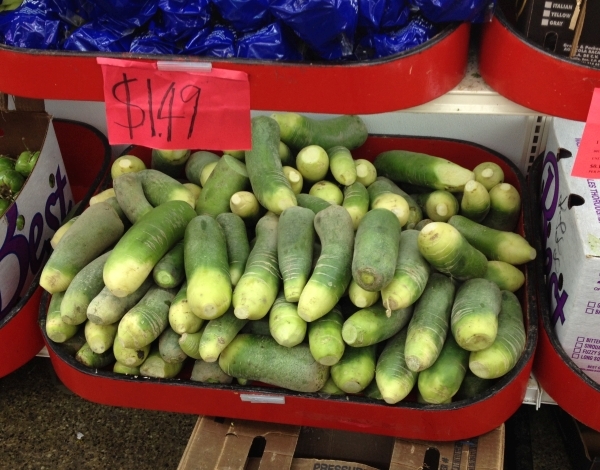 Daikon tastes similar, but lacks the nice color. 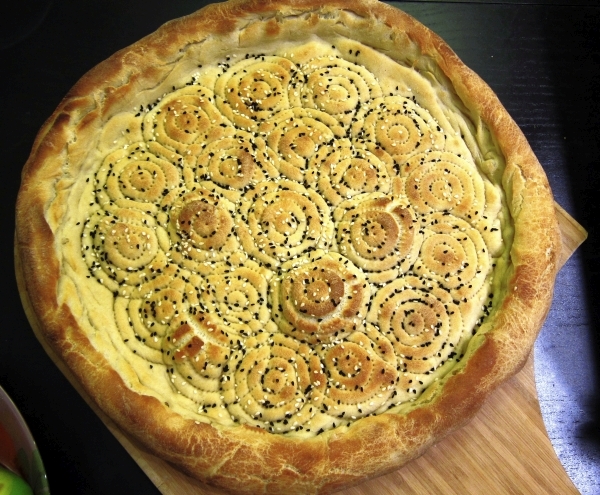 This recipe is adopted from Stalic Khankishiev’s book “Базар, казан и дастархан” as well as Hakim Ganiev’s book “Восточный пир”. Stalic has a video recipe for this dish, but he does it slightly differently than in his book – using yogurt instead of mayonnaise for the dressing. 1. Skin the green radish and slice it into sticks. Let the radish sticks sit in a bowl of salted cold water for 30 minutes. 2. Skin and chop a few garlic cloves lengthwise. 3. Rub the beef with salt and pepper. 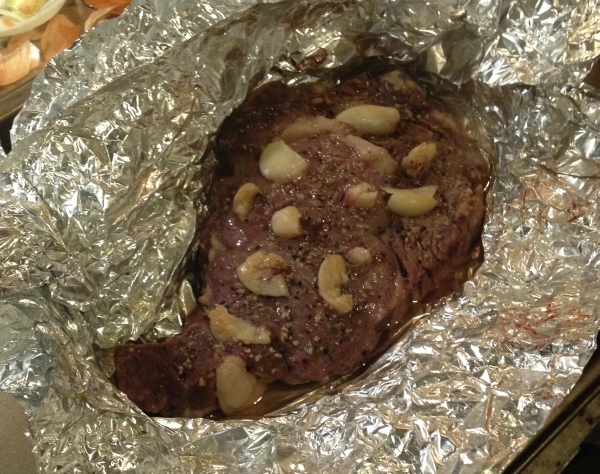 Using a knife, make little holes in the beef and stick the garlic pieces inside. Do this all over the beef on both sides. Ainsley Harriott demonstrates the technique quite enthusiastically in this video. 4. Wrap the beef in foil (use at least 2 layers) – make sure it’s tightly sealed, then put it on a baking pan in the oven for 30 minutes at 400F. 5. Skin an onion, and chop it into rings. Cover the onion rings in flour and sift them a bit to get rid of the excess flour. 6. Deep fry the onion rings until golden brown. Let them drain on a paper towel. 7. When the beef is done (it would taste delicious as-is for a simple meat dish), let it cool down, then slice it into long, thin strips. 8. Layer the bottom of the serving dish with the radish slices, then the meat slices, then cover this with a generous amount of mayonnaise. Put the fried onion rings on top. Imagine you are in one of the finest Uzbek restaurants of Soviet-era Moscow. Priyatnovo appetita! If you don’t want to go all that trouble, a simple salad of green radish, salt, pepper, and oil is a refreshing accompaniment to heavy food and easy to make. 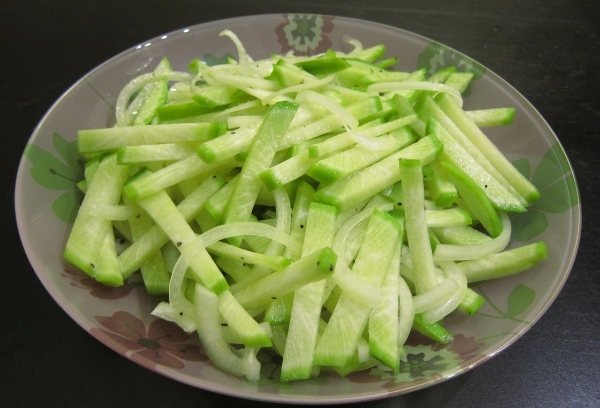 It’s no “Uzbekistan” salad, but it’s a nice way to eat green radish. Morkovcha is an accident of history. 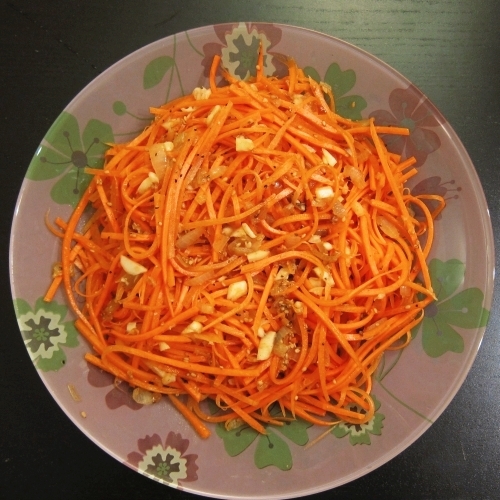 Despite its name in Russian – морковь по-корейски (“carrots Korean-style”) – this dish is virtually unknown in Korea. 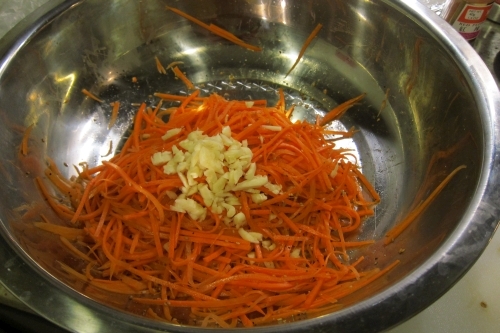 Morkovcha is essentially a type of kimchi made with ingredients that were readily available in Central Asia: carrots, vinegar, onions, and garlic. It’s a crisp, refreshing salad that goes well with Central Asian food, and is popular all across the former Soviet Union. It’s also very easy to make. This recipe is from Natalia Kim’s website za100le.ru. Her Youtube channel has lots of Russian and Central Asian video recipes. 1. 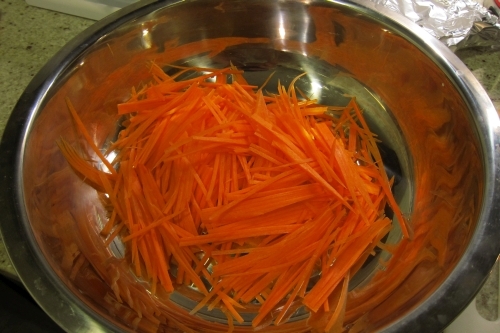 Cut the carrots into long, thin slices. I use a julienne slicer for this purpose. 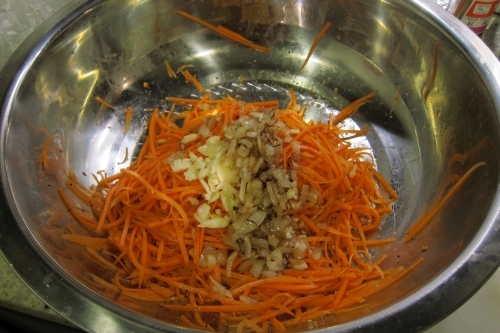 Salt the carrots, add vinegar, mix well, and let this sit for about half an hour. 2. The carrots will have given off juices. 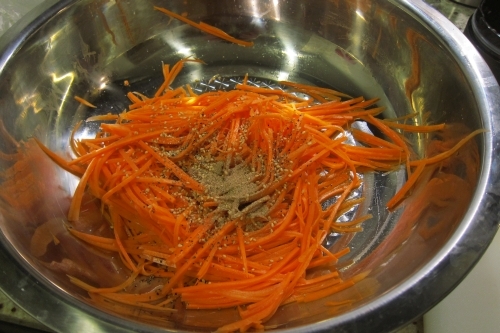 Drain the juice from the carrots, then add the other spices to taste. Make sure not to add too much coriander powder, as it can give the resulting salad a gritty texture. Mix well. 3. Chop up some garlic and put it in a pile on top of the salad. 4. Dice a small onion, fry until brown in oil, then pour the onion and hot oil over the garlic. Many Russian-influenced salads have this last step of pouring hot oil over the salad. You should hear a sizzling noise as the oil hits. Mix everything well. The salad is complete! Enjoy! 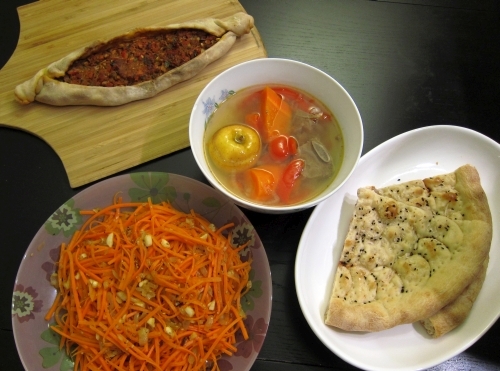 Morkovcha with pide, shurpa, and nan bread.